UNESCO believes that universal access to information and knowledge is key to the building of peace, sustainable social and economic development, and intercultural dialogue. Through the technical possibilities made available by the increased sophistication of ICTs and user oriented social media, the traditional Free and Open Source software (FOSS) models of effective collaboration and innovative sustainability have now expanded and include highly diverse realms of public domain activity. Open Access (OA), Open Data and crowdsourcing platforms, Open Educational Resources (OER) enable information to be freely and legally shared, providing strategic cross-cutting opportunities to improve the quality of decision-making as well as facilitate policy dialogue, knowledge sharing and capacity building, including for persons with disabilities. Free and Open Source Software – providing a wide range of tools and processes for creating, exchanging, and sharing interoperable software and solutions efficiently and effectively. 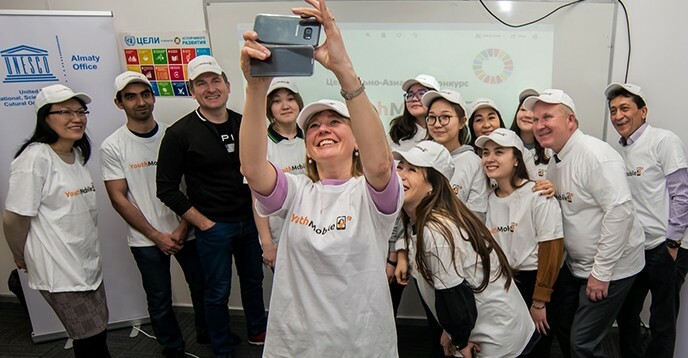 UNESCO Almaty as well, is active in the YouthMobile initiative. From 26 November 2018 till 25 January 2019, the UNESCO Almaty Office held a call for proposals for developers of mobile applications and Apps training materials focused in local problems solution.